Paul Hefeld and Jacob Lepidus were Latvian immigrants who stole the wages from Schnurrman's rubber factory on the corner of Tottenham High Road and Chesnut Road on 23 January 1909. The two stood at the corner armed with pistols, and when the chauffeur-driven car carrying the wages clerk drew up, they seized the leather cash bag and shot at the chauffeur and a passing stoker who grappled with Lepidus. PCs William Tyler and Albert Newman (510 N) came running from the nearby police station in Tottenham High Road, and there then started a long chase during which the anarchists would fire over 400 rounds at their pursuers. A passing housewife threw a potato at them, and an increasing number of police officers joined the chase, some armed with truncheons, and another mounted on a bicycle brandishing a cutlass. PC Newman persuaded the chauffeur to run the gunmen down at the Mitchley Road Mission Hall, but this resulted in the car's radiator water pipe being ruined by gunfire, the chauffeur wounded, and the death of a 10-year old boy Ralph Joscelyne. 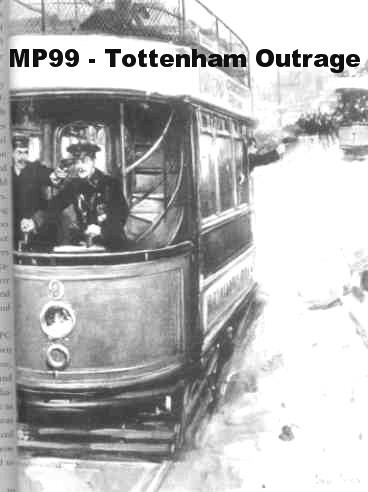 By this time the pursuers included footballers, labourers, duckshooters and gypsies, but when they reached Chingford Road the robbers commandeered a tram, and forced the conductor to drive it whilst the driver hid upstairs. In turn the police commandeered a tram going in the opposite direction and reversed it in hot pursuit until the conductor warned the robbers of a nearby police station. This caused them to abandon the tram for a milk van, which they wrecked by cornering too fast, and then a greengrocer's horse and van which would only go slowly because they had not released the brake! After a further chase on foot, Hefeld gave up in a state of exhaustion and shot himself, dying in hospital 3 weeks later. Lepidus locked himself in a cottage at Oak Hill and shot himself dead just as PCs Charles Eagles, Charles Dixon and John Cater broke in to arrest him. These three officers were later awarded the King's Police Medal for gallantry.